The most common types of headaches are also the most effectively treated with chiropractic care – without the need for potentially harmful medication. Stress/Tension headaches, migraine headaches, and sinus headaches top the list and account for the great majority of all headaches. Fortunately, all three forms have one thing in common – they all respond well to chiropractic care! It has been estimated that greater than 80% of headaches are related to “stress”. This can refer to both physical (poor posture, joint dysfunction, etc.) and psychological (work deadlines, financial worries, etc.) stressors. No matter which type of stress is involved, the events leading to the onset of headache pain are the same. Several of the nerves that exit the highest portion of the neck loop back to travel over the top of the head to the forehead. These nerves pass through a triangle of muscles called the suboccipital (“below the skull”) triangle. When these muscles at the base of the neck become irritated (due to either physical strain or emotional stress), they tend to tighten impinging the nerves passing through the triangle. This can create headache pain and pressure at the temple, forehead, bridge of the nose or behind the eye. 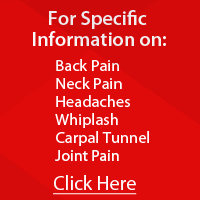 Tightness and pain in the upper portion of the neck often accompany this type of headache. Doctors call this form of headache a stress headache or cervicogenic (“originating from the neck”) headache. It should be fairly obvious that alleviating joint dysfunction and muscle tightness in the neck would eliminate headaches caused by physical stress. However, even if the headaches are caused entirely by emotional stress, decreasing irritation of the same joints, muscles and nerves can also greatly improve symptoms. Although it has been widely recognized for over 100 years that chiropractic is effective at reducing (and often eliminating) the symptoms of migraine headaches, it was not until recently that researchers fully understood how. In fact, it took the discovery of a previously unknown anatomical structure to answer this question. A tiny ligament (about the size of the tip of a ball-point pen) was found by dental researchers that were performing anatomical dissections on cadavers. This ligament connects the uppermost bone of the spine directly to the outer layer of the spinal cord (dura mater). The researchers theorized that abnormal motion or position of this bone would likely cause tension on the spinal cord altering cerebrospinal fluid (CSF) pressure in the brain. This correlates strongly with recent theories by medical researchers linking pressure changes in the brain to migraine headaches. Sinus headaches are often characterized by a sensation of pressure accompanied by pain over the sinuses. The most commonly affected sinuses are located behind the eyebrows and cheekbones. Poor drainage of the sinus cavities will often lead to an increase in sinus pressure and, eventually, head pain. With all of the allergies in the Houston area, this is a very common problem. The chiropractic approach to reducing sinus pressure pain is to improve drainage of the sinuses. A number of techniques are available including stimulation of the facial nerves, treatment of acupressure points and thinning of trapped mucous with deep heat therapies. A skilled chiropractic clinician can determine which method best suits your needs.